The capital city on the principal Hawaiian island, Honolulu is an important and much-visited tourist destination. There are some superb beaches here, such as those around Waikiki, together with a host of quality museums, unique cultural attractions and the only actual royal palace in the whole of the USA. The plentiful restaurants serve up a tasty Pacific Rim fare, with many of the most popular restaurants boasting views across the beachfronts. Foodies will find that the restaurants based around Honolulu's oriental Chinatown are particularly notable, while those local eateries located in and around the Ala Moana Center mall are conveniently placed for shoppers. Plenty of cyber cafes are on hand at Waikiki and at the University of Hawaii System (UH), suiting those in need of some Wi-Fi action. 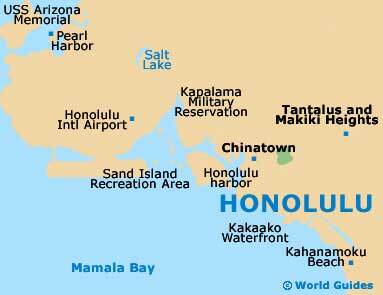 If you are intending to visit the island of Oahu, you may find the following selection of Honolulu links of use. Bishop Museum - 525 Bernice Street, 96817. Battleship Missouri Memorial - 1 Arizona Memorial Place, 96818. USS Bowfin Submarine Museum and Park - 11 Arizona Memorial Drive, 96818. Honolulu Museum of Art - 900 South Beretania Street, 96814. Spalding House - 2411 Makiki Heights Drive, 96822. Hawaii State Art Museum - 250 South Hotel Street, 96813. Pegge Hopper Gallery - 1164 Nuuanu Avenue, 96817. Ala Wai Golf Course - 404 Kapahulu Avenue, 96815. Coral Creek Golf Course - 91-1111 Geiger Road, Ewa Beach, 96706. Hawaii Kai Golf Course - 8902 Kalanianaole Highway, 96825. Ko Olina Golf Club - 92-1220 Ali'inui Drive, Kapolei, 96707. Palmer and Fazio Courses at Turtle Bay Resort - 57-049 Kuilima Drive, Kahuku, 96731. Olomana Golf Links - 41-1801 Kalanianaole Highway, Waimanalo, 96795. Waikele Country Club - 94-200 Paioa Place, Waipahu, 96797. Aloha Tower Marketplace - 1 Aloha Tower Drive, 96813. Nu'uanu Pali Lookout - Nu'uanu Pali Drive, 96813. State Capitol Building Tour - 415 South Beretania Street, 96813. Honolulu Zoo - 415 South Beretania Street, 96813. Iolani Palace - 364 South King Street, 96813. Waikiki Aquarium - 2777 Kalakaua Avenue, 96815. Byodo-In Temple Gardens - 47-200 Kahekili Highway, Kane'ohe, 96744. Honolulu Botanical Gardens - 50 North Vineyard Boulevard, 96817. Hawaii International Film Festival (HIFF) - various locations. YMCA of Honolulu Metropolitan Office - 1441 Pali Highway. Moana Surfrider - a Westin Resort and Spa - 2365 Kalakaua Avenue. Royal Garden at Waikiki - 440 Olohana Street. Halekulani Hotel - 2199 Kalia Road. Ilikai Hotel and Suites by Aqua - 1777 Ala Moana Boulevard. Maile Sky Court Hotel - by Aqua - 2058 Kuhio Avenue. Aqua Palms and Spa - by Aqua - 1850 Ala Moana Boulevard. Pacific Beach Hotel - 2490 Kalakaua Avenue. Hilton Hawaiian Village - Waikiki Beach Resort - 2005 Kalia Road. Embassy Suites Waikiki Beach Walk - 201 Beachwalk Street. Sheraton Waikiki - 2255 Kalakaua Avenue. The Royal Hawaiian - 2259 Kalakaua Avenue. Honolulu International Airport - 300 Rodgers Boulevard / Queen Liliuokalani Freeway H1. Kalaeloa Airport - Boxer Road / Midway Street, Kapolei. Dillingham Air Field - Farrington Highway SR-930, Waialua. Marine Corps Base Hawaii (MCAS) - 1st Street, Kaneohe Bay, Kailua. The CAB - 738 Kaheka Street. VIP Trans - 443 Kalewa Street. Sakura Limousine - 758 Kapahulu Avenue. Roberts Hawaii - 680 Iwilei Road, Suite 700, 96817. Honolulu Star-Advertiser - 680 Iwilei Road, Suite 700, 96817.